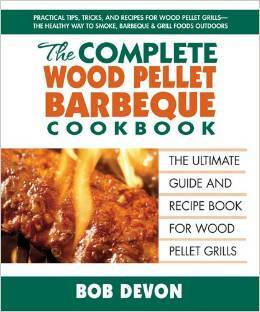 The Complete Wood Pellet Barbeque Cookbook , by Bob Devon, explores yet another type of outdoor cooking. Wood pellet grilling is an excellent option for outdoor chefs. A wood pellet grill can be used as a smoker, a grill, a barbeque, and a convection oven. You can fuel your wood pellet grill with different kinds of wood, which will give you different and distinct flavors. Considering these options, a wood pellet grill is a very versatile outdoor cooking tool that can provide you with many delicious possibilities. The beginning of this cookbook includes a very thorough explanation of wood pellet grills and how they work. It takes you through the basics of wood pellet grilling—everything from the operation and maintenance of your grill to the different kinds of wood pellets you can use and how they pair with certain types of meat. For example, apple wood pellets are best used in the preparation of poultry, beef, ham, lamb, pork, and sausages. The rest of the cookbook contains fabulous recipes. There is a whole chapter dedicated to basic barbeque rubs, spice blends, marinades, and sauces. There are recipes for burgers, seafood, turkey, chicken, pork, beef, and sausage. There are even vegetable, sandwich, and pizza recipes. The last chapter is titled, “The Sweet Life: Desserts From the Grill”. So if you are at all interested in wood pellet grilling, this cookbook would be the perfect place to start! The author and his wife describe this cookbook as “the result of our 'love affair' with wood pellet cooking”. Maybe you will feel the same!